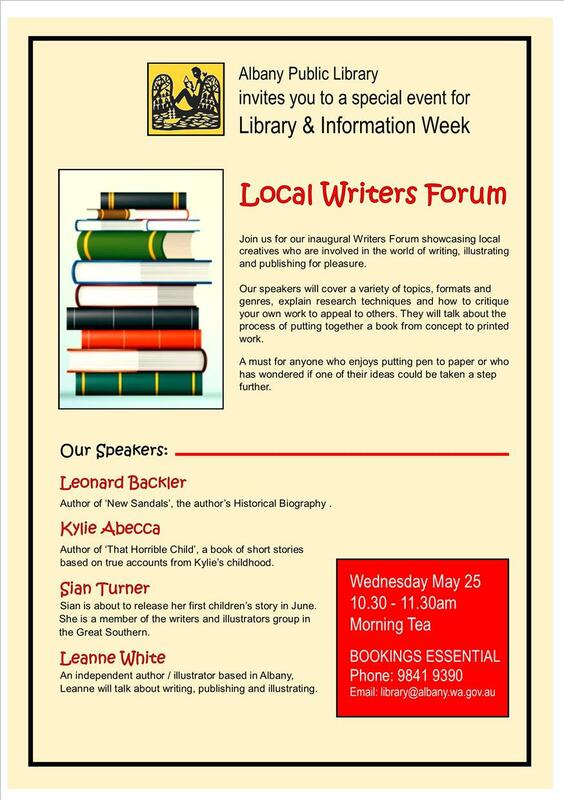 As part of Library and Information week, the Albany Public library hosted its inaugural local writer’s forum. I was lucky enough to be invited along as a guest speaker. Being at the start of my writing journey, I focused on the networks and organisations I’ve found particularly helpful since deciding to pursue a career in writing for children. The CYA conference in Brisbane, the SCBWI national conference in Sydney and the WA SCBWI Rottnest retreat. The forum was well attended and it was wonderful talking to other passionate writers interested in everything from memoirs and family history to fiction for children. I enjoyed the opportunity to speak, mingle and share my story and look forward to further opportunities like this in the future.